Cohousing began in Denmark. The first cohousing community was built in 1972 for 27 families, close to Copenhagen. Since then cohousing has spread rapidly, and today 1 percent of the Danish population, about 50,000 people live in cohousing. Sweden also has a long-standing cohousing tradition. The Swedish feminist movement played a key role to promote cohousing as a way to share common chores more equally between the genders. Today, the association Kollektivhus Nu (“Cohousing Now”) is successful in promoting the idea across the country. In Sweden most of the Cohousing projects are state-owned, as they were developed as part of a large societal project of an active welfare state; recently built cohousing however is now also privately owned. The Netherlands‘ first cohousing (“Centraal Wonen”) was built in the mid-70s. Today there are more than 100 Centraal Wonen projects in the Netherlands. The Netherlands have created a particular type of cohousing model, which is based on the organisation of large cohousing communities into clusters of 5 to 10 units. Each of these clusters has its own common facilities and the right to choose its new members, however, there is one large commonly shared building for parties, meetings etc. Around half the cohousing projects in the Netherlands are large scale. There are some 300 senior cohousing communities ("Groepswonen van Ouderen") in the Netherlands. In Germany the opportunity of the ‘baugruppen’ model for groups to access land has led to significant growth in Cohousing; there are more than 150 Cohousing projects in Berlin’s region alone, giving rise to the of Berlin being a worldwide centre for Cohousing. Cohousing is now growing in the rest of Europe, namely France, Spain, Belgium, and Italy. In Italy two types of cohousing organisations have emerged Cohousing Venture, a private cohousing consultancy firm, and CoHabitando and CoAbitare, both non-profit companies. The Danish term bofællesskab (living community) was introduced to North America as Cohousing by two American architects, Kathryn McCamant and Charles Durrett. Since the first cohousing community was completed in the United States, Muir Commons in Davis, California, now celebrating 25 years, more than 160 communities have been established in 25 states, with more than 125 in development. 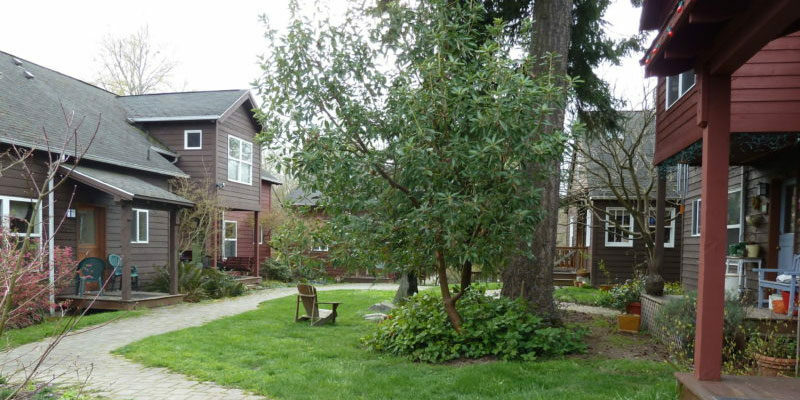 The Cohousing Association of the US is the main resource point. Cohousing is also gaining popularity across Canada, Australia, New Zealand and Japan.